This week has clearly been dedicated to massive events films. This morning brought news that we’ll be seeing the first official trailer for Avengers: Infinity War, but of course, we can’t go a single day without Star Wars, right? 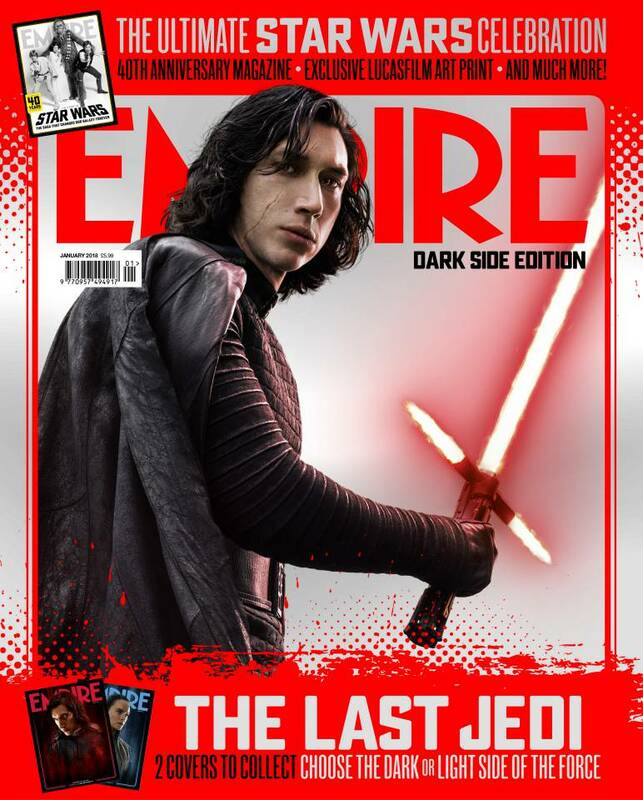 With December right around the corner and Rian Johnson’s The Last Jedi just weeks away, Empire Magazine has taken today to reveal their official newsstand covers for quite possibly the most anticipated film of all-time. Just a few days ago we were graced with the Porg-centric subscribers cover, and now, we are given the holy grail of covers for The Last Jedi. Rather than giving us one or even two, Empire has given us four covers to grovel over for the next few days, and yes, you are given the chance to choose a side – the Light or the Dark. They are beautiful, and while I typically tend to lean towards the light side, the dark side and Kylo Ren looks absolutely fantastic. He looks incredibly menacing and just pissed off in more ways than one. As for Rey, how can you not love anything and everything about Daisy Ridley? While she looks so innocent and good, there’s no doubt something dark in her that’s brewing. Is she going to the dark side? In my opinion no, but that doesn’t mean she doesn’t have demons to deal with. She’s lost, and it’s clear that she’s been searching for something for a long time. She wants answers and that could mea taking missteps before she unlocks her full potential and destiny. And in my opinion, that means becoming one of the great Jedi to ever live. With The Last Jedi focusing so much on the Kylo Ren and Rey dynamic, I really hope my thoughts of their paths being the main focus come true. If used correctly, these two characters could collide for years to come, well passed Episode IX. They’re final path is in a cloud of mystery, yes, but at this point is seems like they’ll be fighting each other on opposite sides of the conflict. While it would be interesting to see them come together and venture down a separate path that takes them away from the Resistance or First Order, I’m much more interested in seeing them facing off against one another for years to come, if not just in The Last Jedi and Episode IX. Whatever may happen, I’m definitely getting my hands on a pair of these covers. What do you think of the covers? Do you think the Kylo Ren and Rey dynamic will be a main focus going forward? How excited are you for the film? Rian Johnson’s Star Wars: The Last Jedi hits theaters on December 15th.